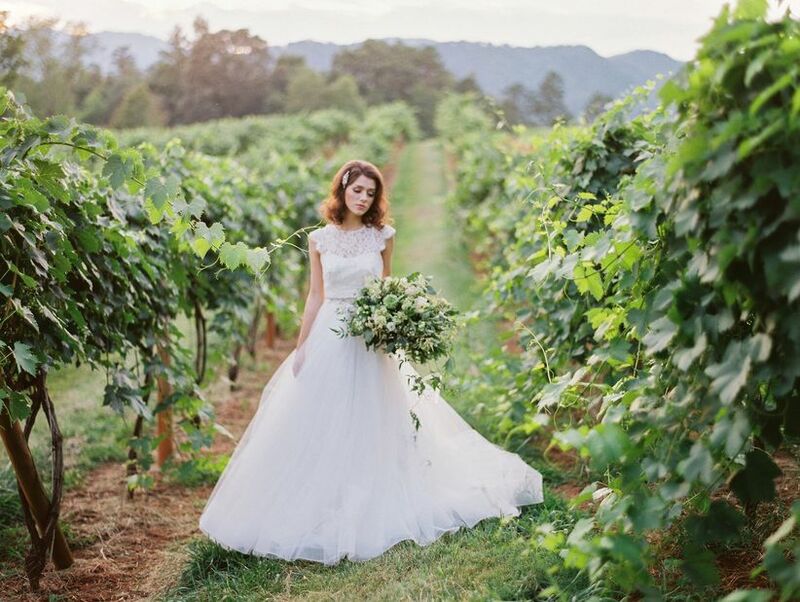 Take a look at these stunners for some inspiration. 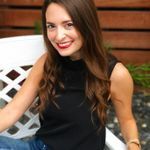 The ‘80s are a decade whose trends are often best left in the past; it was a time when everything was big — big sleeves, big hair, big veils. 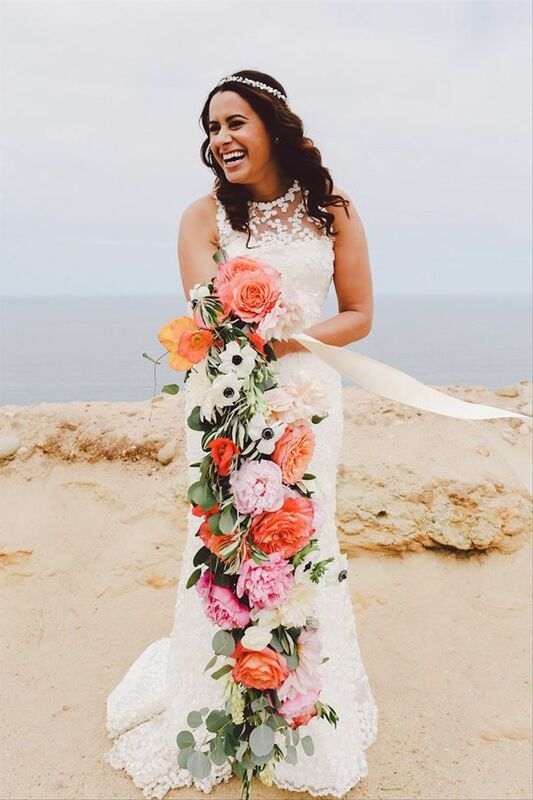 But it introduced one trend that we are more than happy to make an exception for: cascading bouquets. 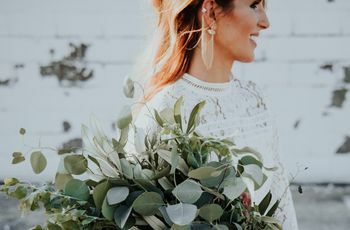 Long, luscious, and, yes, big, these decadent floral arrangements are making a comeback among today’s brides, and it’s easy to see why. They achieve a look of effortless beauty, from chic elegance to bohemian wild. 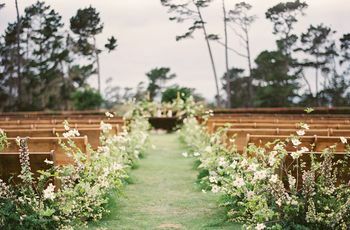 They can be as large and lush as you want or feature a few trailing vines for a subtle effect. Take a look at these stunners for some inspiration. 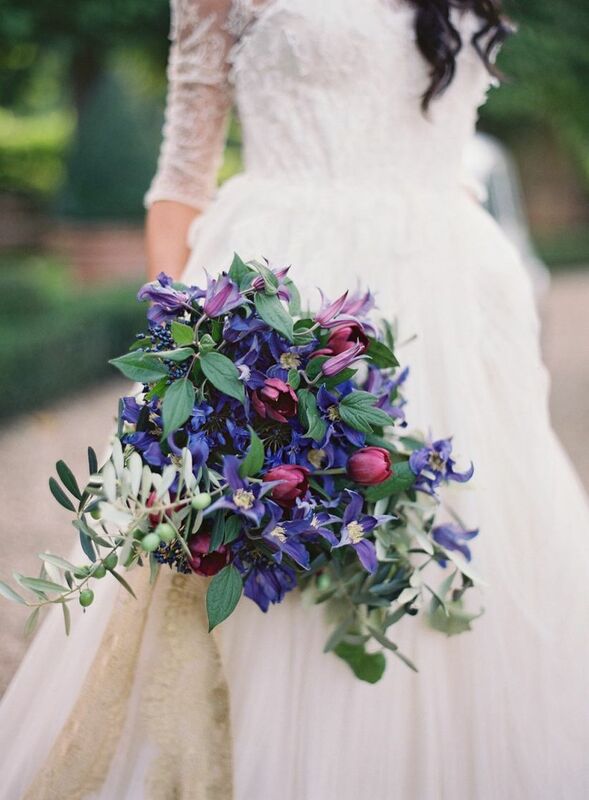 Rich, jewel-toned blooms in plum and fuchsia carry an air of vibrant sophistication and elegance. 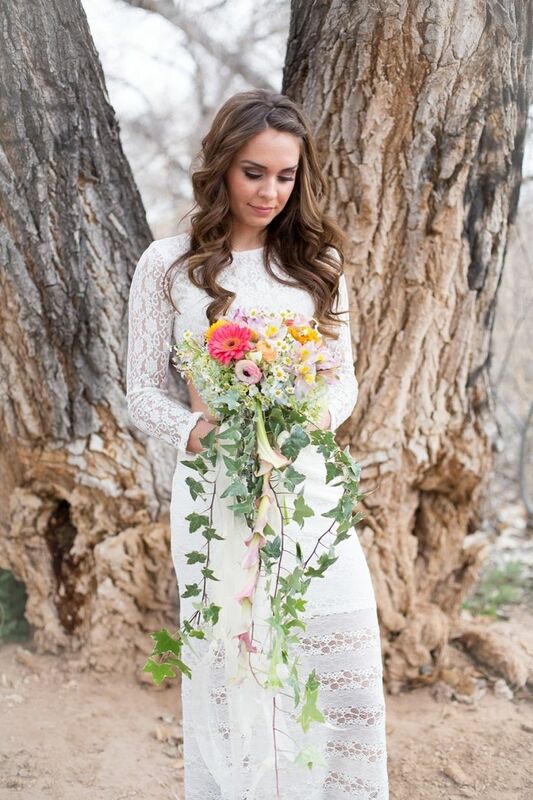 Nothing says cascading bouquet like this trail of pretty of florals. 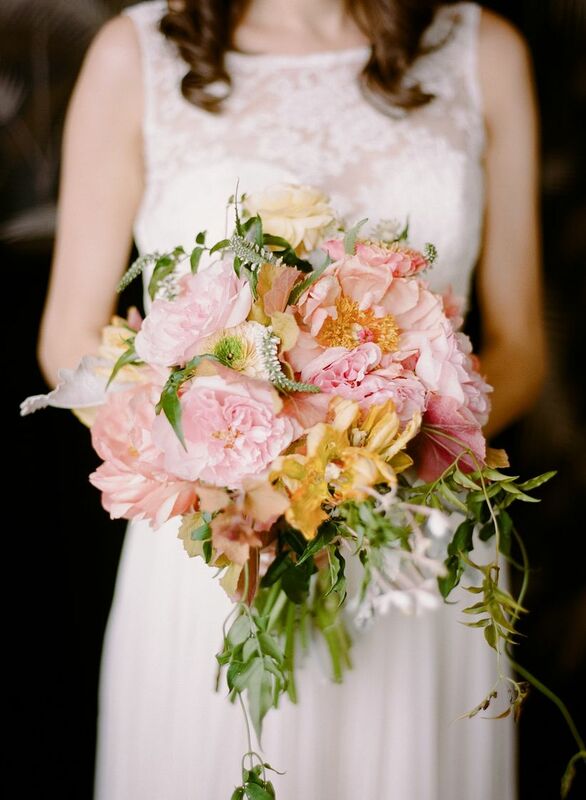 Coral garden roses, pink peonies, soft orange and pale coral dahlias, tuberose, white anemones and ranunculus, silver dollar eucalyptus, and olive branches combine for punches of color. 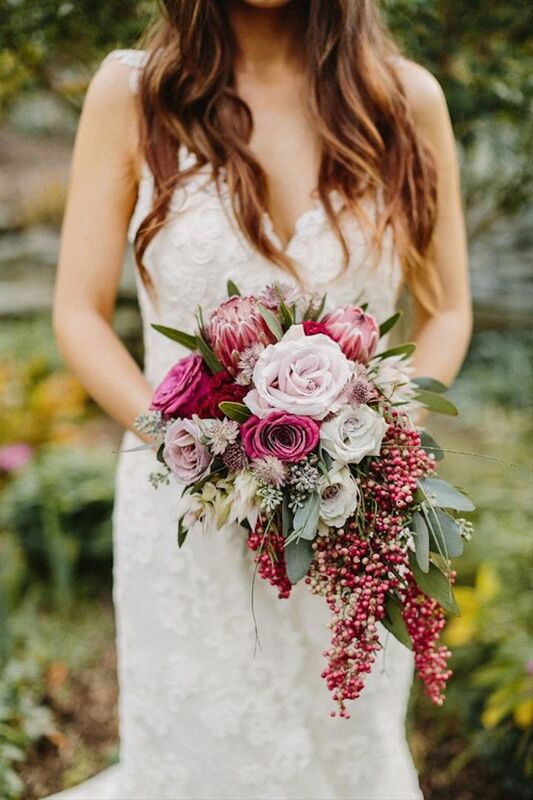 This sweet bouquet is overflowing with springtime flair and romance, boasting classic florals such as roses and some spindly greens. 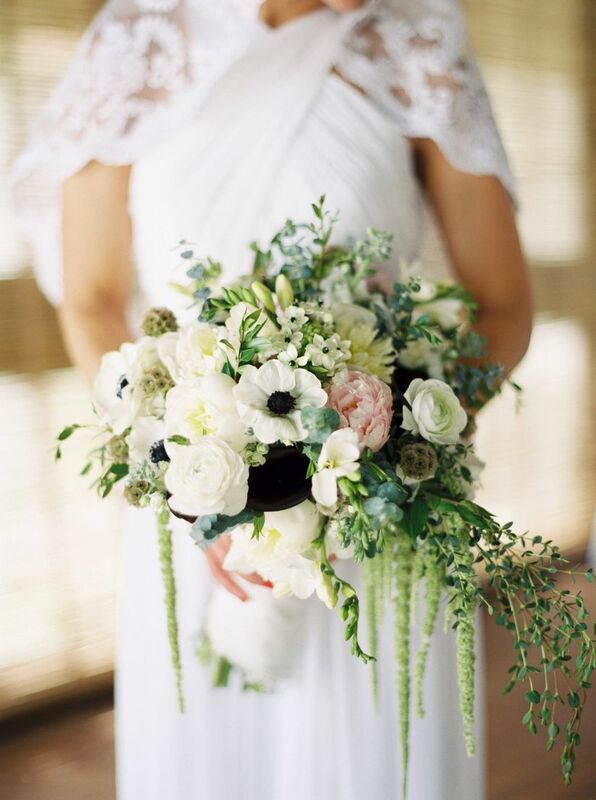 This rich bouquet keeps it simple with lush greenery and soft pops of white florals. Its organic style takes inspiration from nature’s natural hues. 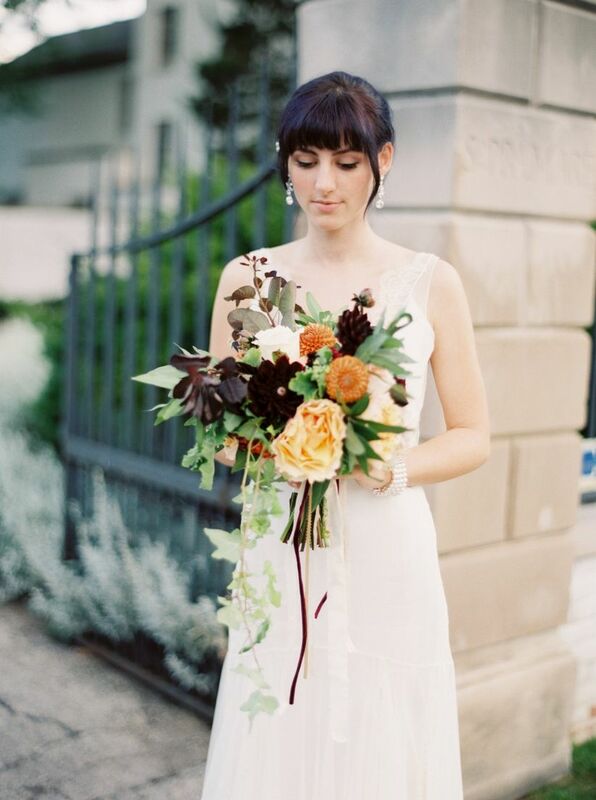 This delicate, beautiful bouquet carries a hint of bohemian style, featuring 60s-inspired florals. 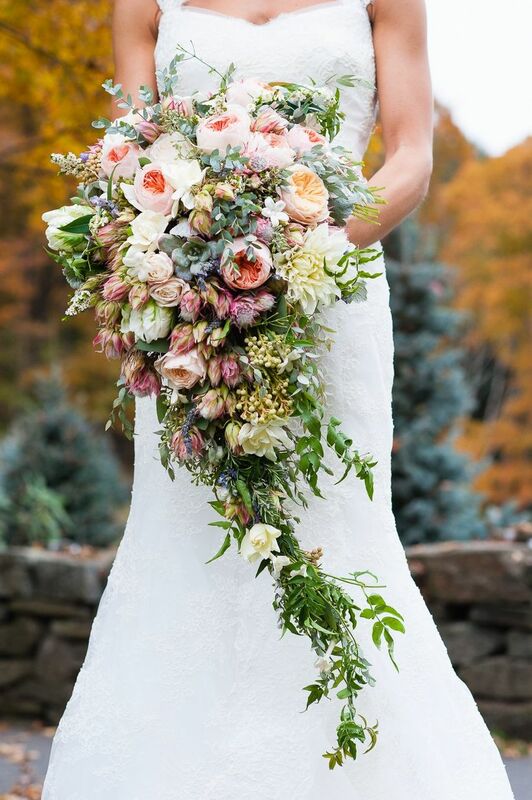 This wildly rustic masterpiece of a bouquet by Siren Floral Co. is brimming with life and color. Hot hues of magenta, neon orange, and violet dance together in rustic whimsy. 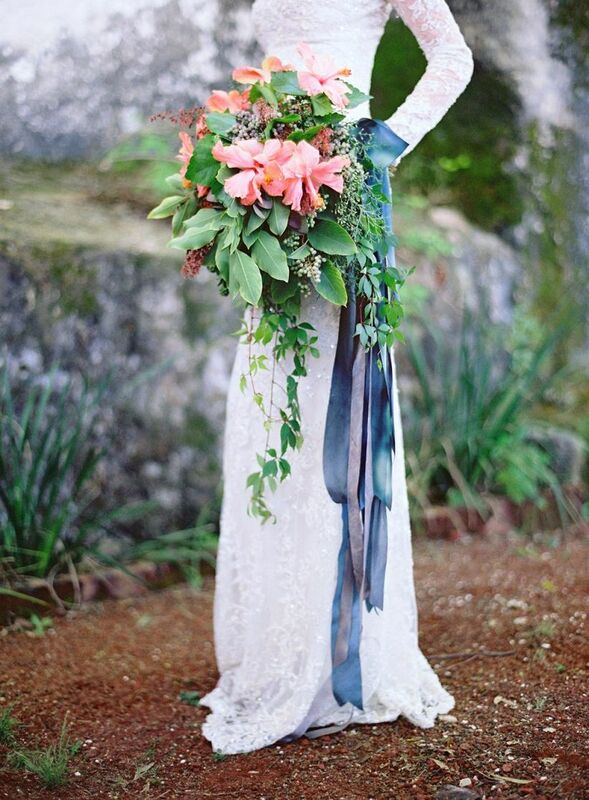 Vivid pinks and sage greens are summertime fab, achieving a subtler cascading look with a few spills of flora. 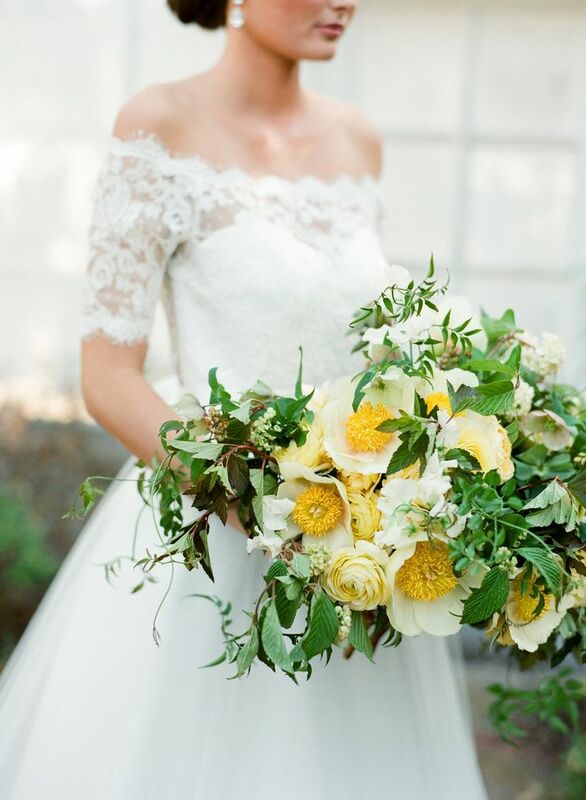 This sunny bouquet popping with yellow flowers and haphazard greenery is charming and cheerful. 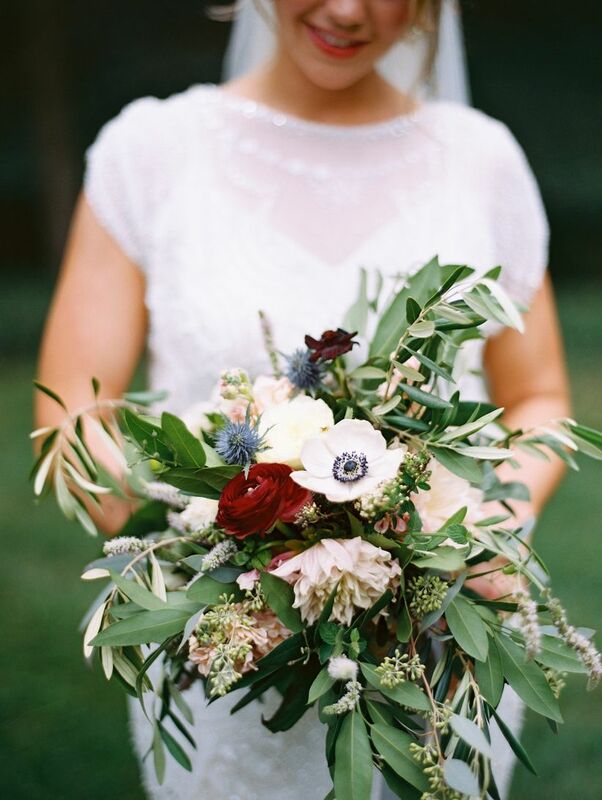 A marsala color palette lends this moody bouquet a feminine autumn vibe, while cascading berries bring a unique touch. 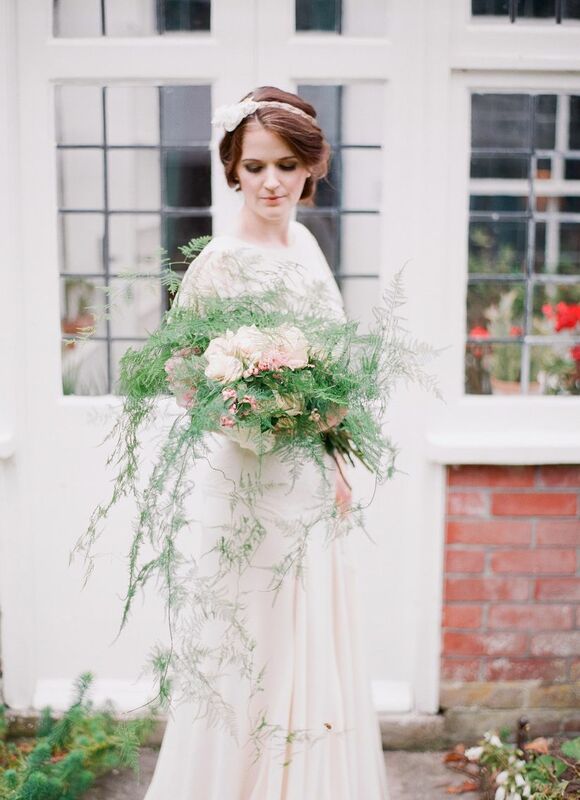 Whimsical meets ethereal in a whispy bouquet of greenery. A gathering of husky pastel blooms and greens has a relaxed elegance. Bright and gorgeous, this bouquet boasts a bounty of pink and yellow flowers as the centerpiece, accented by trailing vines. 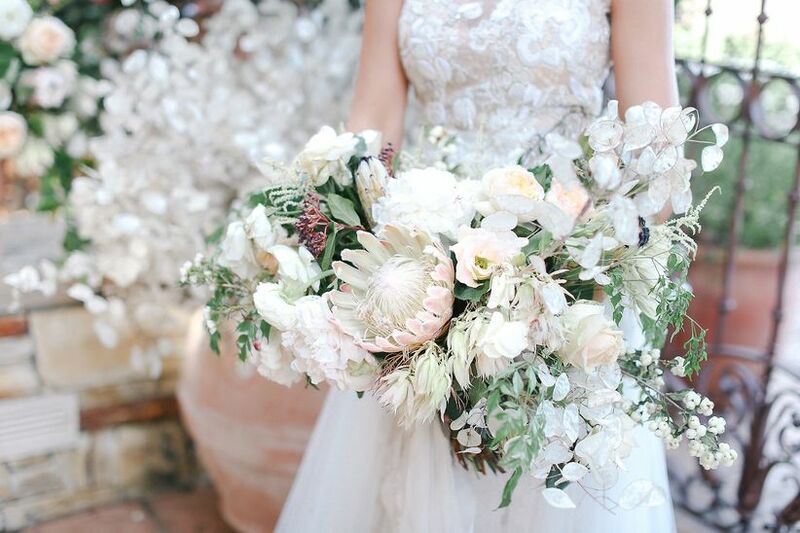 Stark white blooms make a chic and classy statement, surrounded by cascading botanicals for a subtle burst of color. 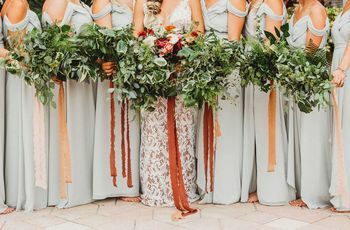 Trumpet vine, coral hibiscus, and privet berries create a decadent bouquet with a tropical feel, while a trailing blue ribbon enhances the cascading effect. 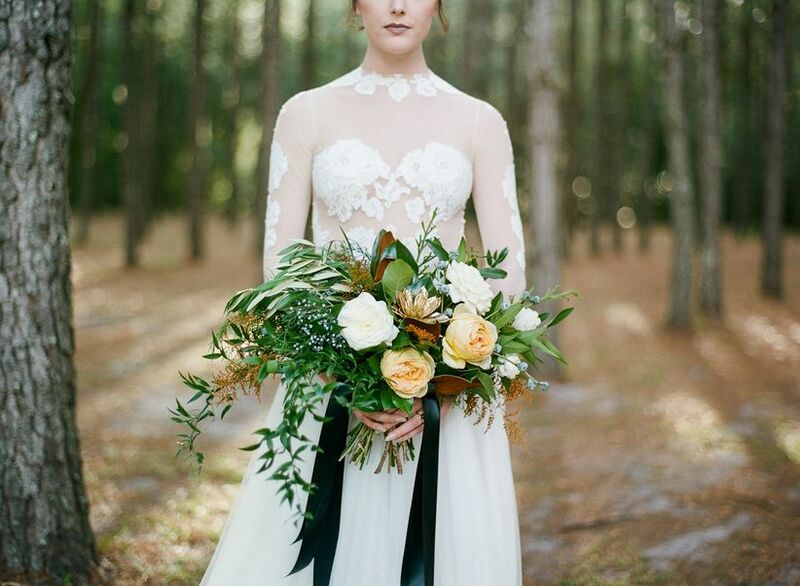 This woodland inspired bouquet has a glam, sultry vibe thanks to luscious greenery, gold succulents, and an onyx ribbon. 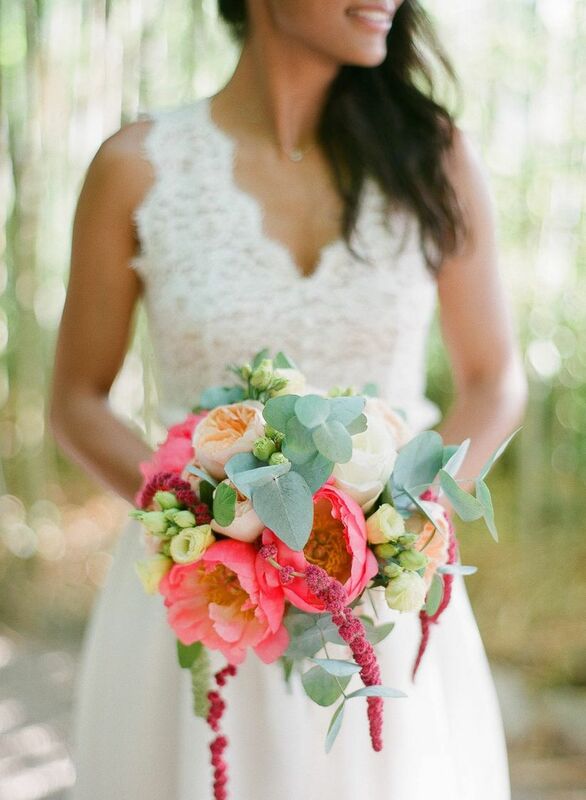 Crimson, periwinkle, and blush blooms create an unexpected, but stunning color palette against rich green leaves. 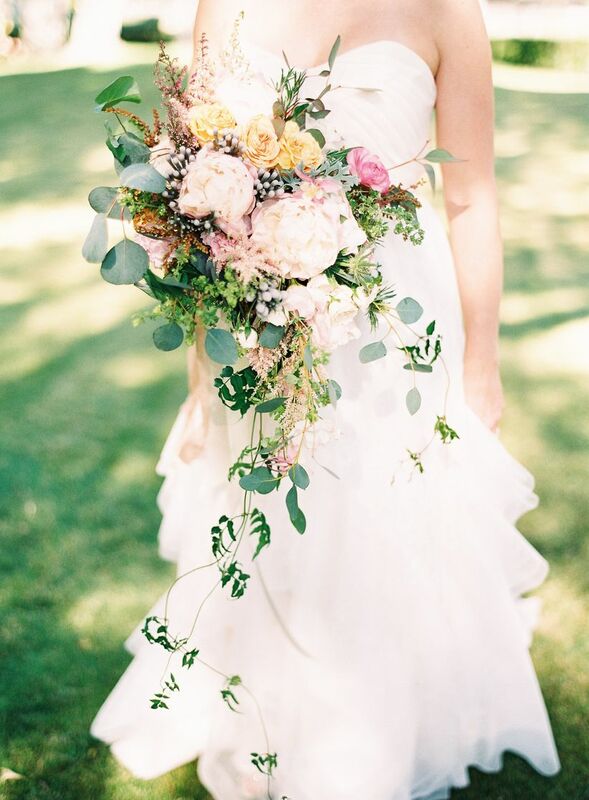 This horizontal bouquet in watercolor hues features the dreamiest combination of fresh florals, perfect for a springtime wedding. 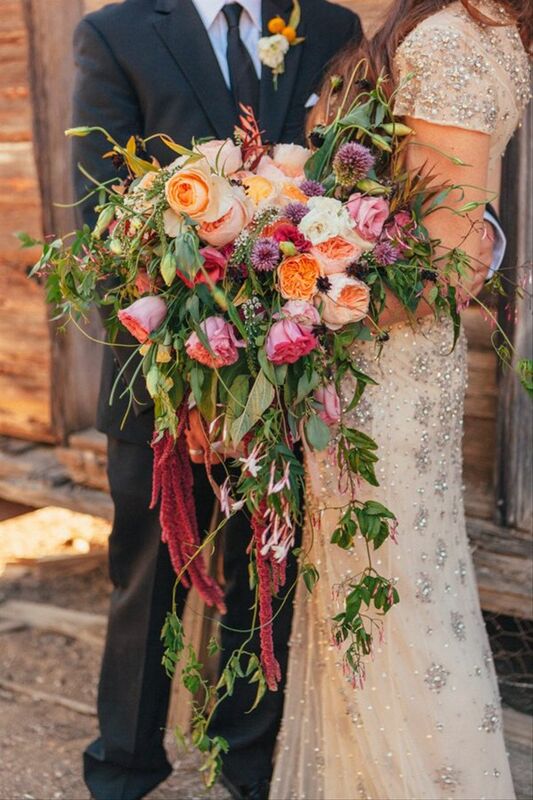 A lone cascading vine of ivy makes an elegant statement in this earthy bouquet of deep plum hues and rustic orange tones. 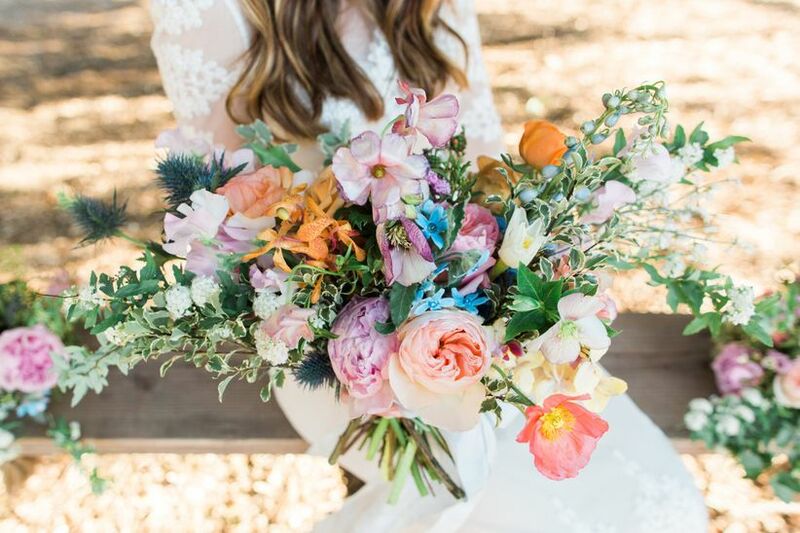 Fall florals take pastel shades for a spin in a romantic bouquet abundant with blooms, looking like it came straight from a fairytale garden. 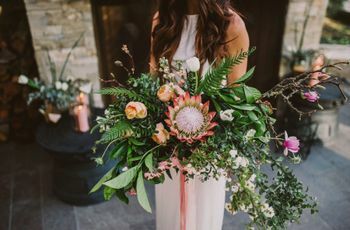 Protea and silver dollars are the star of this ethereal bouquet, where blush pink, cream, and greenery combine for winter, muted hues under a desert spell.